Movie animal trainers use their knowledge of animal behavior to train and care for a variety of species. Movie animal trainers use operant conditioning (positive reinforcement techniques) to train animals to perform specific behaviors that are desired for roles in television and movies. They must bring animals out to the set for multiple shots that may be taken throughout the day. They also are responsible for providing appropriate physical and mental exercises to keep animals healthy and happy during the hours they are not working on set. Trainers must follow guidelines from the American Humane Association set representative to ensure that the animal care provided meets or exceeds industry standards. Additional duties for movie animal trainers may include providing food and water, administering medications and supplements, maintaining cages and enclosures, exercising animals, keeping accurate health and behavior records, and transporting animals. Movie animal trainers must also work closely with large animal, small animal, equine, and exotic animal veterinarians to maintain the health of their collection. Movie animal trainers must be physically fit and capable of working outdoors in changing weather conditions and extreme temperatures. It is common for trainers to be on call for work at night, on weekends, and on holidays. A trainer’s schedule may be particularly intense during a shoot when lengthy 10 to 12 hour days are frequently required. Extensive travel may also be necessary to bring animals to shooting locations, especially if the trainer is not located in an area where movie production is common (such as California or New York). Trainers must have the appropriate trucks, trailers, and other equipment to facilitate the safe movement of animals, or they must contract with someone who can provide this service. International travel will require additional passports, permits, import or export restrictions, and mandatory quarantine periods when animals enter a foreign country. Movie animal trainers may specialize in working with a specific type of animal (such as working primarily as a dog trainer or marine mammal trainer for example). They may also work with a more varied group of domestic or exotic species, depending on their personal preferences. Some of the most popular movie animals include big cats, reptiles, dogs, cats, horses, bears, elephants, parrots, farm animals, and birds of prey. Some animal trainers work primarily in feature films, while others specialize in working with animals for commercials or print ads. Others work in any form of media that is required. While a college degree is not mandatory to enter this field, most movie animal trainers either have a degree in an animal-related field or have significant practical experience gained by interning with experienced trainers. Common college majors for aspiring animal trainers include animal science, animal behavior, biology, zoology, marine biology, and psychology. One well known educational option for movie animal trainers is the Exotic Animal Training Management program at Moorpark College (in California). This intensive 7-day-a-week associate degree program lasts for 22 months. Approximately 50 students are accepted to the program each year. Degree recipients have gone on to work at most major zoos, animal parks, and in Hollywood. 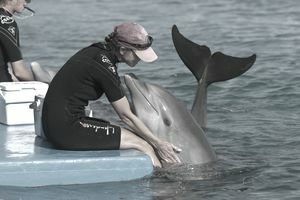 Movie animal trainers may also gain practical experience from completing zoo animal internships, marine mammal internships, or other animal-related internships and training programs. Interning with an experienced trainer is also a great way to learn the ins and outs of the business, gaining valuable hands-on experience along the way. Ideally, the aspiring animal trainer should pursue a degree, complete several internships, and then go on to shadow an experienced professional in the business. While the Bureau of Labor and Statistics (BLS) does not separate movie animal trainers out from the more general category of animal trainers, a 2014 study found that the mean annual animal trainer salary was $32,400. The lowest ten percent of animal trainers earned less than $17,650 while the highest ten percent of animal trainers earned a salary of more than $57,160. The most popular states for animal trainers in the 2014 study were California with 1,490 jobs, Illinois with 1,240 jobs, and Florida with 1,050 jobs. The mean annual salaries for these states were listed as $37,700 in California, $28,320 in Florida, and no salary reported for Illinois. There is extremely strong competition for movie animal trainer positions, as there are relatively few openings combined with a high level of interest in this career path. Additionally, there has been a shift in the entertainment industry away from using live animal actors, with more directors choosing to use digital animation to achieve the desired results on screen.